What is .NET Framework ? .NET Framework is is a software framework developed by Microsoft that runs primarily on Microsoft Windows. It includes a large class library known as Framework Class Library (FCL) and provides language interoperability (each language can use code written in other languages) across several programming languages. Programs written for .NET Framework execute in a software environment (as contrasted to hardware environment), known as Common Language Runtime (CLR), an application virtual machine that provides services such as security, memory management, and exception handling. FCL and CLR together constitute .NET Framework. .Net was originally known as NGWS (Next Generation Windows Services) which was said to be an Internet based platform of Next Generation Windows Services. The Common Language Runtime is the foundation (heart) of .Net Framework. 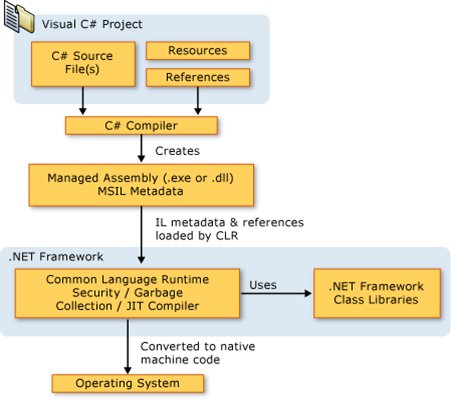 All .Net programs execute under the super vision of CLR. Managed Code : Code that targets the CLR is known as managed code. Unmanaged Code : Code that does not targets the CLR. If you are using some third party software example VB6 or VC++ component they are Unmanaged code as .Net runtime (CLR) does not have control over the source code execution of the language. For example, VC++ has MSCRT40.DLL, VB6 has MSVBVM60.DLL,and Java has Java Virtual Machine etc. Similarly, .NET has CLR. • Garbage Collection: - CLR automatically manages memory thus eliminating memory leaks. When objects are not referred, GC automatically releases those memories thus providing efficient memory management. • Code Access Security: - CAS grants rights to program depending on the security configuration of the machine. Example the program has rights to edit or create a new file but the security configuration of machine does not allow the program to delete a file. CAS will take care that the code runs under the environment of machines security configuration. • Code Verification: - This ensures proper code execution and type safety while the code runs. It prevents the source code to perform illegal operation such as accessing invalid memory locations etc. • IL (Intermediate language)-to-native translators and optimizer’s:- CLR uses JIT, compiles the IL code to machine code, and then executes. CLR also determines depending on platform what is optimized way of running the IL code. MSIL stands for Microsoft Intermediate Language. We can call it as Intermediate Language (IL) or Common Intermediate Language (CIL). During the compile time , the compiler convert the source code into Microsoft Intermediate Language (MSIL) .Microsoft Intermediate Language (MSIL) is a CPU-independent set of instructions that can be efficiently converted to the native code. During the runtime the Common Language Runtime (CLR)'s Just In Time (JIT) compiler converts the Microsoft Intermediate Language (MSIL) code into native code to the Operating System. The .NET Framework class library is a library consisting of namespaces, classes, interfaces, and datatypes included in the .NET Framework. This library is organized into namespaces that contain functionally related groups of classes. 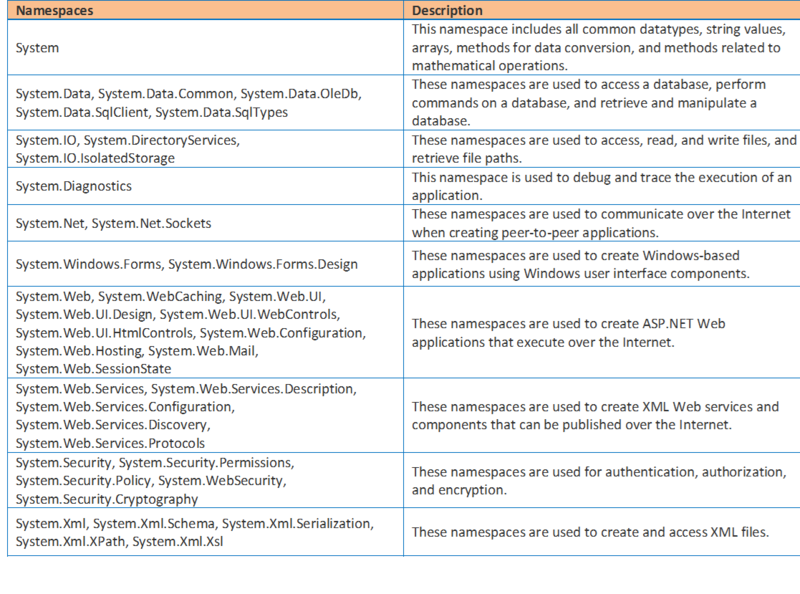 These namespaces are divided among different categories, such as data access, common types, debugging, file access, network communication, security, Windows applications, Web applications, Web services, XML data etc. The Base Class Library is a simple runtime library for modern programming languages. It serves as the Standard for the runtime library for the language C# as well as one of the CLI Standard Libraries. It provides types to represent the built-in data types of the CLI, simple file access, custom attributes, security attributes, string manipulation, formatting, streams, collections, among other things. It defines types in the following namespaces. System: Defines the Object class which all reference type objects derive from (including value-type objects) and the Value Type class which all value type objects derive from. It also defines the base data types like integers, floating point numbers, character, strings, Boolean, enumeration and more. Support for the environment and platform and a command-line interface is provided along with base classes for exceptions and attributes. It defines arrays and delegates, mathematical functions and many other types. System.Diagnostics : Defines types that provide the ability to diagnose applications. It includes event logging, performance counters, tracing and interaction with system processes. System.Globalization : Defines types that define culture-related information, including language, country/region, calendars in use, format patterns for dates, currency and numbers and sort order for strings. System.IO : Defines type that enable reading from and writing to different streams, such as files or other data streams. Also provides a connection to the file system. System.Security : Defines types that represent the security system and permissions. System.Security.Permissions : Defines types that control access to operations and resources based on policy. System.Text : Defines types that support various character encodings, regular expressions and a more efficient mechanism for manipulating strings. System.Threading : Defines types that enable multithreaded programming. System.Runtime.CompilerServices : Defines types that provide functionality for compiler writers who use managed code to specify attributes in metadata that affect the run-time behavior of the Virtual Execution System. System.Runtime.InteropServices : Defines types that support Platform Invocation Services (P/Invoke). System.Collections.Specialized : Defines specialized and strongly-typed collections; for example, a linked list dictionary, a bit vector, and collections that contain only strings. System.Net : Defines types that provide a simple programming interface for a number of network protocols. System.Globalization : Defines type that provide information about a specific culture (called a locale for unmanaged code development). The information includes the names for the culture, the writing system, the calendar used and formatting for dates and sort strings. System.Reflection : Defines types that provide a managed view of loaded types, methods and fields, and that can dynamically create and invoke types. System.Security.Permissions : Defines types that control access to operations and resources based on policy. These types are relevant to the reflection. The Extended Array Library provides support for non-vector arrays. That is, arrays that have more than one dimension or arrays that have non-zero lower bounds.The Extended Array Library doesn't add any extra types, but it does extend the array-handling mechanism. The Extended Numerics Library provides support for floating-point (System.Single, System.Double) and extended-precision (System.Decimal) data types. Like the Base Class Library, this library is directly referenced by the C# standard. The data types directly contain data. Some examples are int, char, float, which stores numbers, alphabets, floating point numbers, respectively. When you declare an int type, the system allocates memory to store the value. The String Type allows you to assign any string values to a variable. The string type is an alias for the System.String class.